Today, Eaton Vance reported findings from its eighth annual investors' survey. The study revealed interesting results about investor views on dividends. Also, an interesting data point was GenXers views on real estate as an investment (sounds the same as Boomers perception of technology in late 1999). The great majority of American investors (73%) agree with the statement: "Firms that pay dividends tend to be predictable cash generators, and healthy dividends are a sign of financial strength." Three times as many investors (45%) say they increased investment in dividend-payers over the past three years as say they decreased investment in these stocks (16%). Investors show a strong preference for companies using dividends to return cash to shareholders, with two-thirds (69%) indicating they prefer a company to pay a dividend rather than only buying back stock. More investors (44%) say they prefer a smaller dividend grown annually over a large but unchanged dividend (25%) or share buybacks (19%). Senior investors are more likely to indicate a preference for dividends over buybacks (74%) than Baby Boomers (62%). GenXers also indicated a strong (70%) preference for dividends. The popularity of dividends is reflected in the fact that over half of investors (58%) say they currently invest in dividend-paying stocks. 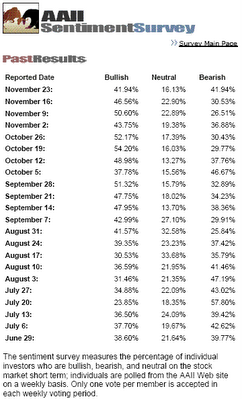 Few investors (3%) knew that nearly two-thirds, or 64%, of the overall return from stocks as measured by the S&P 500 Index has historically come from reinvested dividends (Source: Ned Davis Research). Half of investors (51%) who increased investments in dividend-paying stocks over the past three years say the reduction of the tax rate on dividend income to 15% in 2003 was a factor in their decision to do so. Notably, 52% of GenXers--the most of any generation--say they would start investing or increase their investments in dividend-paying stocks if Congress makes the tax cut permanent. Senior investors (34%) and Baby Boomers (31%) choose stocks as the investment they think of first for income generation, while GenXers (34%) say real estate. In fact, as the results of Eaton Vance's study show, investors' perception of real estate as a reliable return generator persists, despite the fact that the housing market has slowed dramatically, with September housing starts down 18% year-over-year (Source: U.S. Census Bureau News). Nearly as many investors predicted real estate would offer the best after-tax returns among major investment categories over the next five years as picked stocks (30% versus 35%). "This summary highlights the major findings of a comprehensive telephone study among 1,209 U.S. residents 25 years and older (about 400 per age cohort: GenXers 40 and younger, Boomers 45 to 60 and seniors 65 years or older), who have over $50,000 invested in both qualified retirement plans and investments outside of qualified retirement plans (stock mutual funds, bond mutual funds, individual stocks, individual bonds, variable annuities and money market funds). This study, which represents a portrait of American investors' attitudes and practices about investing across three generations, was conducted by Penn, Schoen & Berland Associates, Inc. for Eaton Vance Corp. This representative national study of 1,209 American investors was conducted between October 2 and November 11, 2006. By definition, all investors surveyed have a portfolio of at least $50,000, excluding housing. 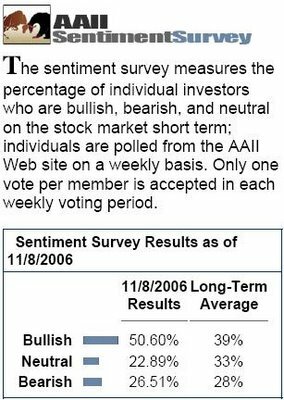 71% have investable assets greater than $100,000, while one in seven have a portfolio of $1 million plus"
Bearish sentiment as reported by AAII rises again as reported for November 30, 2006. 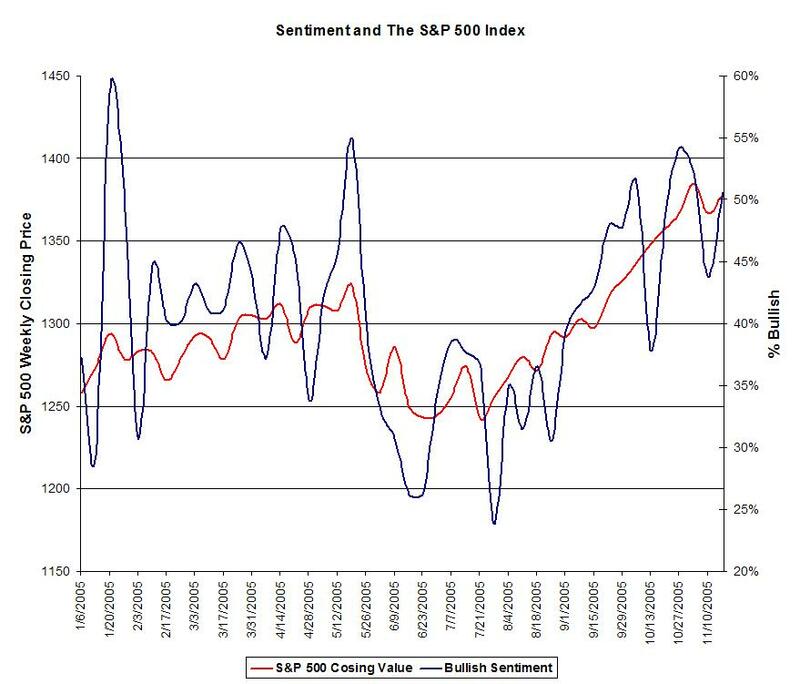 Bullish sentiment stills seems a little high; however, is this contrarian indicator indicating another leg up for the market? An attractive aspect to using a dividend growth methodology in evaluating stocks is the dividend growth method enables an investor to gauge, indirectly, the cash flow of a company. Because cash is important to a company's survival, changes in a company's dividend practices may signal future cash flow issues for a company. Dividend growth stocks should not be looked at as simply investments that grow their dividend on an annual basis; but, the methodology leads to investment in companies that are growing their business as evidenced by growth in company cash flow. The other important aspect to successfully investing in dividend growth companies is to focus on the higher quality firms as rated by Standard and Poor's. S&P's Quality Ranking measure attempts to capture the "quality" of earnings issue. What is cash flow versus earnings? Earnings of a company are essentially a figure derived from accounting rules. The problem with "earnings" or "net income" from an accounting perspective, is the figure has very little to do with evaluating the cash flow stability of a company. "(EBITDA) is calculated by adding "selected" expense items such as Interest expenses, Income taxes, Depreciation and Amortization back into earnings or net income. By adding "selected" expense items back into to a company's net income "more positive" earnings or cash flow per share numbers can be manufactured. When utilizing EBITDA an analyst or CFO is actually stating, "This is what our earnings would have been if it were not for interest, taxes, depreciation and amortization." Because it is based upon earnings, EBITDA is subject to the same "creative" accounting inherent in many earnings reports. EBITDA frequently does not reflect a company's true cash flow.... EBITDA is a manufactured "creative accounting" interpretation that presents a company in the best possible light. EBITDA's original use was for lenders to determine credit viability. Today these interpretations are used primarily by companies and Wall Street analysts to promote stock to an unwary public. Commonly, when EBITDA or CFPS (cash flow per share) are used in this way they are deceptively called "cash flow" or some form thereof." Cash provided by financing activities. 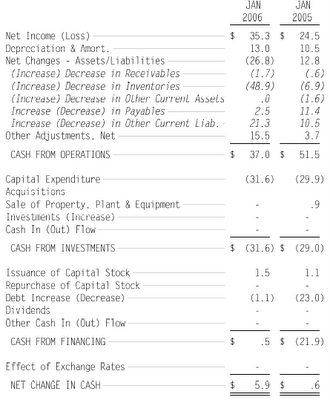 The key section to review on the cash flow statement is the one detailing operating cash flow. 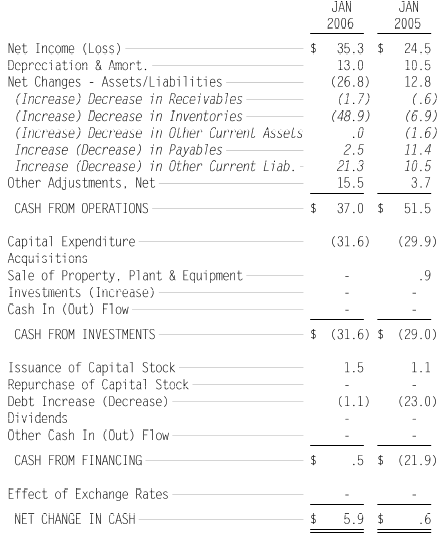 Once the operating cash flow figure is analyzed, it should be converted to a per share number. This figure can be evaluated across quarters to determine any negative or positive trends. Additionally, growth, or lack of growth in operating cash flow per share can be compared to companies within the same industry or across industries. The last step in this analysis is to take the price of the stock divided by the operating cash flow per share to come up with a price to operating cash flow figure. This number can be used to evaluate stocks in the same way one uses the P/E ratio. 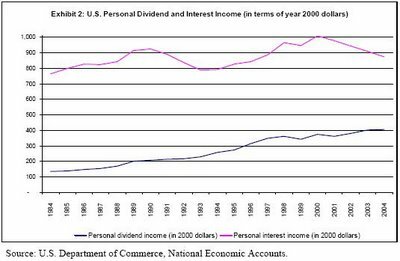 As one can see from the above charts, net income has grown nicely, but cash flow has actually declined from year end '05 to '06. Note the large cash usage ($48.9 million) in 2006 attributable to an increase in inventory. "In 2006 we have rebounded from a challenging 2005 fiscal year. Our financial results through the first three quarters have exceeded our expectations and the stock price has risen 20% in the past 12 months." In today's Ahead of the Tape section of The Wall Street Journal, the column discusses some pros and cons of stock buybacks. The article cautions investors that a company's stock buyback announcement should not be taken at face value. "Buybacks aren't always what they seem. A company might throw confetti for its share repurchase plan with one hand while issuing shares with the other." 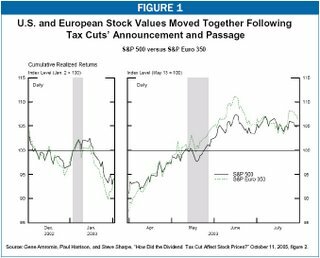 The article further cautions investor not to mistake earnings per share growth from buybacks with actual EPS growth. "At the same time, investors need to be careful to avoid mistaking earnings-per-share growth from buybacks for actual earnings growth." One way an investor can obtain insight into the true earnings picture of a company is to review the company's cash flow statement. Additionally, an investor can monitor the dividend growth rate of a company to better gauge what the company's board might be projecting about future business prospects. If the dividend is not growing at a rate equal to or greater than the historical dividend growth rate for the company, maybe the earnings growth of that particular company is being enhanced by other factors such as stock buybacks. A recent BusinessWeek online article titled, Making Dividend Plays Pay, and an excerpt from a Standard Poor's Equity Research report, contained an analysis of the yields, payout ratios, and quality make up by sector for several S&P indices. 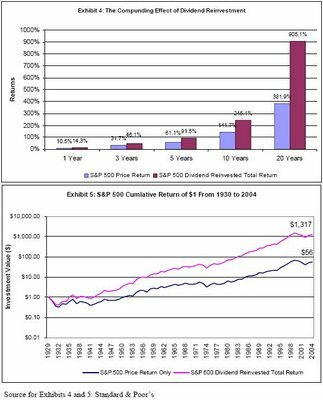 "Dividends—those steady streams of periodic payments received by equity investors—may seem as unexciting as a Social Security check, but you might think again when you realize that reinvested dividends have actually contributed more than 40% of the S&P 500's total return since 1929 (emphasis added). What's more, the S&P 500 dividend yield averaged nearly 4% in all years since the mid-1930s and averaged nearly 6% during the 1940s. Things look a little different these days, of course. The yield on the "500" has averaged only 1.6% thus far this decade, after averaging only 2.4% during the 1990s..."
"Due to the expected tepid market performance, S&P recommends that investors gravitate toward sectors and companies that offer relatively high dividend yields and have consistently increased their earnings and dividends over an extended period of time." When analyzing dividend growth stocks, reviewing a company's cash flow is an important aspect in the analysis. Companies that generate strong growth in cash flow have the ability to: increase the dividend, buyback stock or pay down debt with the cash, just to name a few uses. An investor should be wary of stocks that trade at too high of a yield though. Stocks paying too high a yield can be a precursor to underlying fundamental problems with a company. 6 Secrets to Finding Dividend "Money Machines"
Mergent Broad Dividend Achievers Index (DAA): The Index is designed to track the performance of dividend paying companies that meet the "Dividend Achievers" requirements. To become eligible for inclusion in the Index, a company must be incorporated in the United States or its territories, trade on the NYSE, NASDAQ or AMEX, and have increased its annual regular dividend payments for the last 10 or more consecutive years. In addition, Mergent requires that a stock's average daily cash volume exceed $500,000 per day for the two month period prior to reconstitution. The Index is calculated using a modified market capitalization weighting methodology and is published by the AMEX under ticker symbol “DAA”. Mergent Dividend Achievers Select Index (DVG): The Index is designed to track the performance of dividend paying companies that meet the "Dividend Achievers Select Index" requirements incorporated in the United States or its territories, trade on the NYSE, NASDAQ or AMEX, and have increased its annual regular dividend payments for the last 10 or more consecutive years. In addition, Mergent requires that a stock's average daily cash volume exceed $500,000 per day for the two month period prior to reconstition. 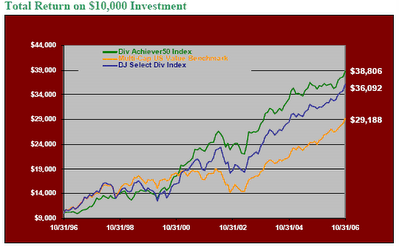 The Dividend Achievers Select Index is calculated using a modified market capitalization weighting methodology. The Index is calculated by the American Stock Exchange under the symbol DVG. KLD Dividend Acheivers Social Index (ESG): Jointly developed using KLD's accepted environmental, social, and goverance (ESG) indexing process and coupled with Mergent, Inc.'s Dividend Achievers™ requirements, the KLD Dividend Achievers Social Index (DASI) is the first Social Index benchmark for equity portfolios subject to ESG screens and dividend criteria. 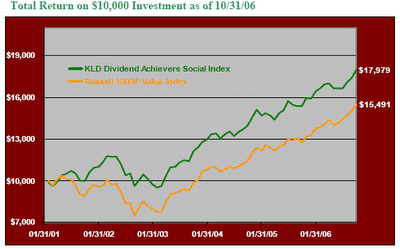 The KLD Dividend Achievers Social Index (DASI) is an equal weighted common stock index comprised of environmental, social and goverance (ESG) screened performers with 10 or more consecutive years of regular dividend growth. Mergent Dividend Achievers50 Index (DAY): The Index, a subset of the Broad Dividend Achievers Index, is designed to track the performance of the top 50 highest yielding dividend paying companies that meet requirements to be classified as "Dividend Achievers". To become eligible for inclusion in the Dividend Achievers Index a stock must be incorporated in the United States, trade on the NYSE, NASDAQ or AMEX, and have increased its annual regular dividend payments for the last 10 or more consecutive years. In addition, Mergent requires that a stock's average daily cash volume exceed $500,000 per day for the two month period prior to reconstitution. The Index is calculated using a yield weighting methodology and is published by the AMEX under ticker symbol DAY. 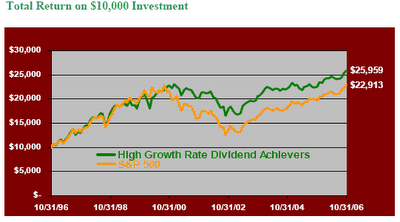 Mergent High Growth Rate Dividend Achievers Index (DAH): The High Growth Rate Dividend Achievers Index, a subset of the Broad Dividend Achievers Index, is designed to track the performance of top 100 Dividend Achievers™ companies by their respective 10 year compound annualized dividend growth rate. 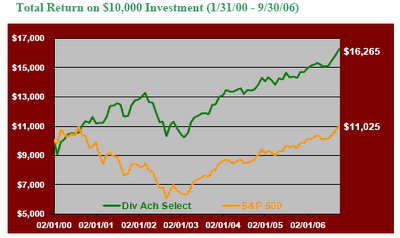 To become eligible for inclusion in the High Growth Rate Dividend Achievers Index , a company must be incorporated in the United States or its territories, trade on the New York Stock Exchange, the NASDAQ system or the American Stock Exchange, and have increased its annual regular dividend payments for the last 10 or more consecutive years. In addition, Mergent requires that a stock''s average daily cash volume exceed $500,000 per day in the two month period prior to reconstition. The High Growth Rate Dividend Achievers Index is calculated using a modified market capitalization weighting methodology. The Index is calculated by the American Stock Exchange under the symbol DAH. Mergent NASDAQ Dividend Achievers Index (DVGT): The NASDAQ Dividend Achievers Index, a subset of the Broad Dividend Achievers Index, is designed to track the performance of Dividend Achievers companies that trade on NASDAQ. To become eligible for inclusion in the NASDAQ Dividend Achievers Index, a stock must be incorporated in the United States, trade on NASDAQ and have increased its annual regular dividend payments for the last 10 or more consecutive years. In addition, Mergent requires that a stock''s average daily cash volume exceed $500,000 per day in the two month period prior to reconstitution. The Index is calculated using a market capitalization weighting methodology. 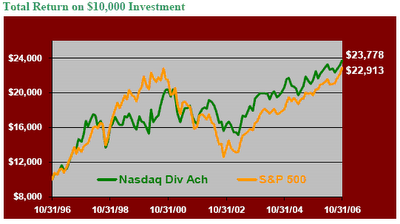 The Index is published by NASDAQ with the ticker DIVQ for the price appreciation and DVQT for the total return. 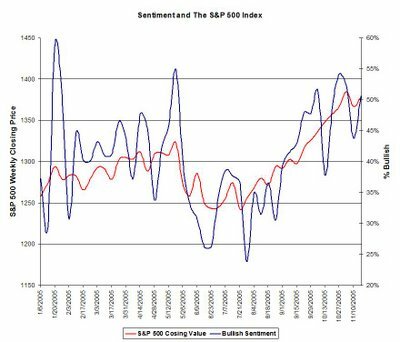 Bearish sentiment is near levels seen at market lows this summer. Real Estate Investment Trusts or REITs can serve as a diversifying vehicle for investment portfolios. REITs generally invest in various types of real estate properties, for example, apartment buildings, healthcare facilities and industrial properties. REITs are required to payout, in the form of dividends, at least 90% of the companies taxable income in order for the REIT to receive special tax treatment from the IRS. 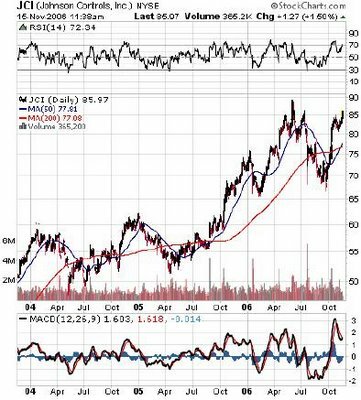 A word of caution at this time is many REIT shares have experienced significant price appreciation over the last few years. A common index that tracks the performance of REITs, the NAREIT Index, has seen its yield decline from over 7% in 2000 to just over 3% currently. 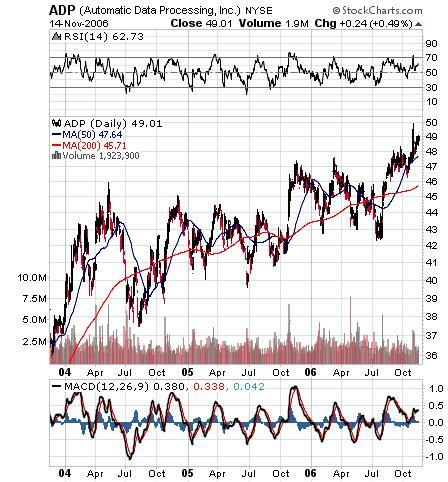 This lower yield is due, in large part, to the appreciation of REIT share prices. In most cases, REITS are best held in tax-deferred accounts as the taxable portion of the dividend does not qualify for special tax treatment and is taxed at the investors ordinary income tax rate. Becton Dickinson (BDX) announced a 14% year over year increase in the company's quarterly cash dividend to 24.5 cents per share versus 21.5 cents per share in the same quarter last year. BDX maintains an S&P Quality Ranking of A+. "...Despite the evidence linking the yield curve to economic growth, and even though yield-curve inversions preceded the two most recent recessions, many have suggested that the yield curve no longer reliably predicts economic growth. Noting that the economy is continually evolving, particularly the financial sector, they discount past successes. They point to two recent “near misses” in 1995 and 1998, when a flat yield curve did not presage slow growth. And indeed, evidence since the early 1990s suggests that the relationship between the yield curve and growth has shifted, if not disappeared." 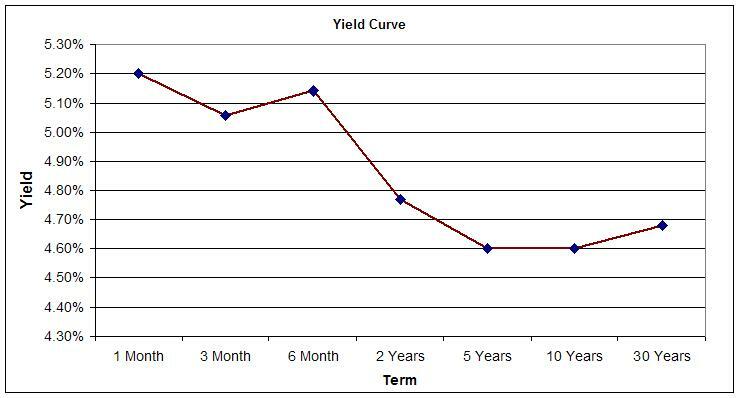 "Economists do not currently have a well-accepted theory of why the yield curve predicts future economic growth. Given that, speculating on whether or not the yield curve is truly predicting a recession remains exactly that: speculation. 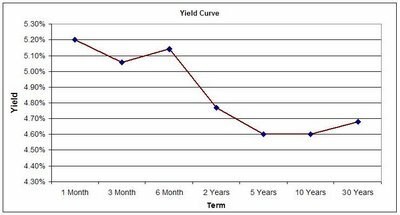 Using the yield curve remains an exercise in judgment that requires balancing the long, successful history of the yield curve’s predictive power with some recent evidence of its fading foresight. It also requires judgment because predictions of real activity represent only one facet of the problem facing the FOMC: Inflation is the other. Still, as the Committee becomes more familiar with the risk-management approach to policymaking, it seems that the signal from the yield curve deserves some weight." 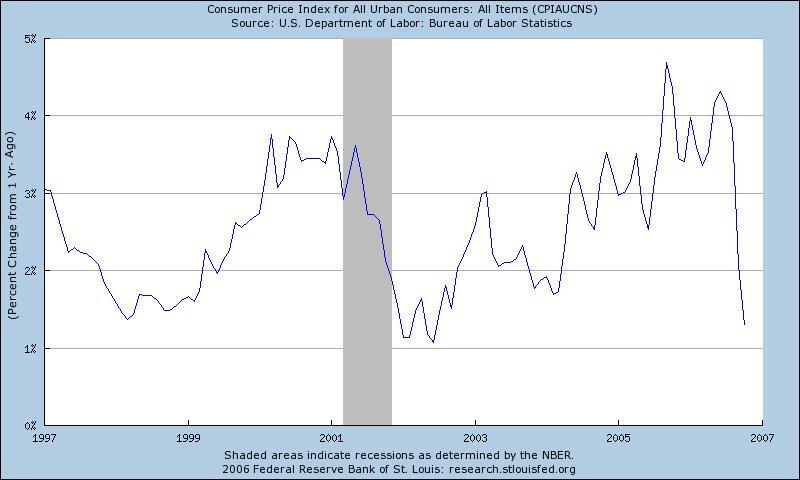 The other variable garnering a large part of the Fed's attention at this time is the level of inflation. As noted by the chart below, data indicate inflation is subsiding. The one caveat from the Federal Reserve article is the author's belief that events may be different this time. Keep in mind, history has a tendency to repeat itself. At this stage in the economic cycle, an investor should consider focusing their large cap investments on the larger higher quality dividend paying companies. These firms should weather an economic slow down better than smaller, higher valuation companies. Asset Allocation: All Bond Portfolio More Risky Than Balanced Portfolio? The American Association of Individual Investors published an article on the free content portion of their site describing five lessons investors should be aware of when making their asset allocation decision. The entire article can be read clicking here. Last month Standard and Poor's reported dividend increases had slowed while stock buybacks were continuing at a strong pace. Certainly, this is a trend worth watching. Like dividends, stock buybacks do benefit investors. The issue with stock buybacks is this type of action is not a long term commitment by a company; therefore, buybacks should have less weight, by an investor, in determing a dividend growth stock's future price performance, i.e, the company's long term growth prospects. The following Dividend Aristocrats have dividend actions yet to be announced in the upcoming three months. The announcement coincides with quarters in which the company would increase their dividend. Today, Johnson Controls (JCI) announced an increase in its quarterly dividend to .33 cents per quarter from .28 cents per quarter in the same period last year. This represents a 18% increase in the dividend. JCI is one of Standard and Poor's Dividend Aristocrats and JCI maintains an S&P Quality Ranking of A+. In the fourth quarter of the company's year ending September 2006, JCI reported earnings that were 24% higher versus the same quarter in the prior year. The fourth quarter earnings totaled $1.86 per share. 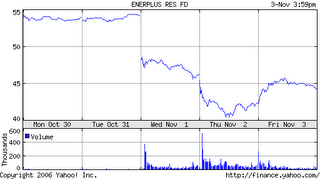 The fourth quarter earnings were 1 cent higher than analyst estimates. The company's fourth quarter revenues increased 18%. Estimated earnings for JCI's upcoming year total $6.03, a 15% increase over this year's earnings of $5.23. If one annualizes the new 33 cent quarterly dividend, the total estimated dividend for the next 12-months equals $1.32. The projected payout ratio totals 22%. This payout ratio is in line with historical averages. The following information was taken from the SEC's website and explains when an investor is entitled to receive a company dividend. In short, an an investor must own a stock prior to the ex-dividend date. If an investor buys or sells the stock on or after the ex-date, he or she will not receive the next paid dividend. "Have you ever bought a stock only to find out later that you were not entitled to the next cash or stock dividend paid by the company? To determine whether you should get cash and most stock dividends, you need to look at two important dates. They are the "record date" or "date of record" and the "ex-dividend date" or "ex-date." Once the company sets the record date, the stock exchanges or the National Association of Securities Dealers, Inc. fix the ex-dividend date. The ex-dividend date is normally set for stocks two business days before the record date. If you purchase a stock on its ex-dividend date or after, you will not receive the next dividend payment. Instead, the seller gets the dividend. If you purchase before the ex-dividend date, you get the dividend. On July 27, 2004, Company XYZ declares a dividend payable on September 10, 2004 to its shareholders. XYZ also announces that shareholders of record on the company's books on or before August 10, 2004 are entitled to the dividend. The stock would then go ex-dividend two business days before the record date. If you sell your stock before the ex-dividend date, you also are selling away your right to the stock dividend. Your sale includes an obligation to deliver any shares acquired as a result of the dividend to the buyer of your shares, since the seller will receive an I.O.U. or "due bill" from his or her broker for the additional shares. Thus, it is important to remember that the day you can sell your shares without being obligated to deliver the additional shares is not the first business day after the record date, but usually is the first business day after the stock dividend is paid. If you have questions about specific dividends, you should consult with your financial advisor. You can also get information by going to your library and reading Standard and Poor's Dividend Record Binder." The author of the comment is largely correct. Importantly, the cause for most of the companies dropping off the Aristocrat list was due to merger or acquisition and not a result of going out of business for financial reasons such as a bankruptcy. 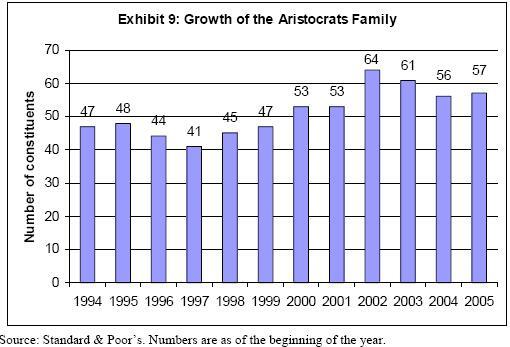 The number of Aristocrats has actually been on the rise. 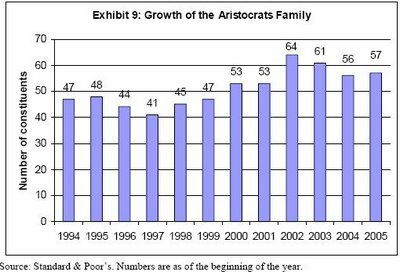 Standard and Poor’s produced a paper (link) in May 2005 covering the history of the Aristocrats. 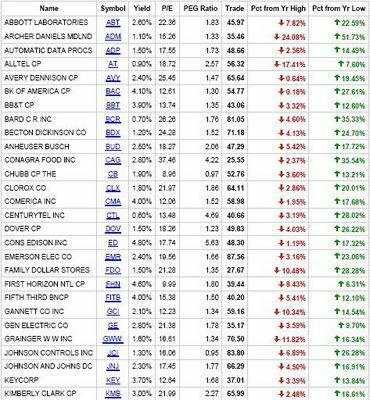 The paper noted interesting conclusions about dividend paying stocks. Although the percent of monthly returns coming from dividends has declined, on average, dividends have accounted for one-third of monthly returns since 1940. 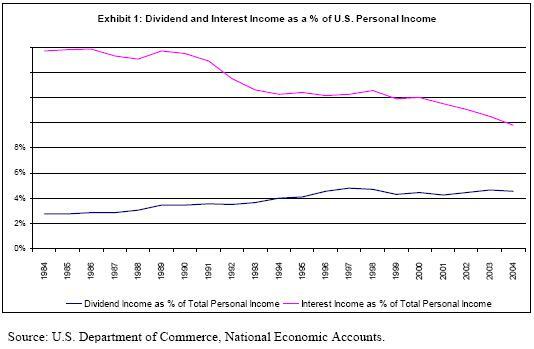 The compounding effect of reinvested dividends is significant. Based on the chart labeled Exhibit 7, might payout ratios be on the increase. Given the strength in corporate earnings over the last three plus years, a large part of the rise in the payout ratio is due to the increase in dividends by S&P 500 companies. Standard and Poor's maintains a list of stocks that have exhibited long term dividend growth qualities. 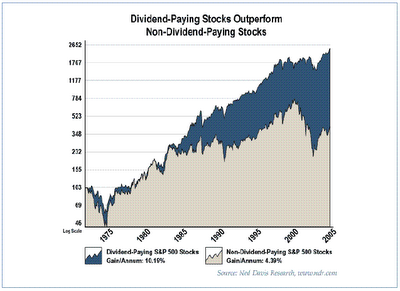 The "Dividend Aristocrats" consist "of large cap, blue chip companies within the S&P 500 that have followed a policy of consistently increasing dividends every year for at least 25 consecutive years. The index portfolio has both capital growth and dividend income characteristics, as opposed to portfolios that are pure yield or pure capital appreciation oriented." Although some of these companies have consistent long term positive dividend characteristics, a few companies may be in industries that are facing unique challenges at this time. For example, the newspaper industry, and companies like Gannett (ticker GCI), is being challenged by the consumer's move to the internet for a great deal of their news. 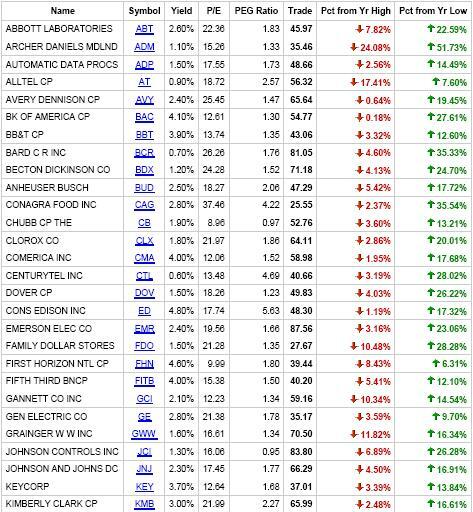 Below is a list of the current dividend aristocrats. In the long run, a market or a stock's, underlying fundamentals will determine whether an investor makes or loses money on a particular investment. In the short run though, technical factors are important issues to consider when investing. Recently, an interesting set of charts was displayed on The Big Picture web blog. The market chart displayed on the site (click here) focused on the Dow. Below I have displayed similar information for the S&P 500 Index. The Dow recently reached a new all time high, while the S&P 500 Index is still below its 2000 high of 1,527. The S&P continues to trade in a longer term up trend channel; however, the index is trading at the top of the channel's range (red line). From a sentiment standpoint, the better time to invest in the market is when the bullish sentiment percentage is lower. The sentiment figures are provided by The American Association of Individual Investors. I do not advocate market timing; however, reviewing market technicals will provide insight to overall market trends. Some might say investing in the stock market is like investing in real estate. One makes money in real estate not based on what they sell a property for, but based on the price paid for the property. In other words, buy low and sell high. Financial professionals (FPs) often advise investors the most important aspect to achieving satisfactory investment returns is to determine ones appropriate asset allocation. Financial professionals will tell investors that 92% of ones return is determined by their asset allocation decision. A number of researchers note FPs have drawn an incorrect conclusion from the BHB study. 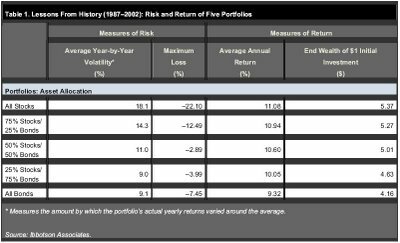 The 92% figure cited in the study was referring to variation (or volatility) of ones returns and not the total returns themselves. This issue was highlighted in an article by William Jahnke titled Its Time to Dump Static Asset Allocation. The two most common asset allocation decisions are strategic and tactical. Strategic asset allocation is the determination of the amount of ones investments that are invested in stocks, bonds and cash. The allocation can be broken down further within each category, for example, large cap equities, small cap equities, etc. Tactical asset allocation involves moving ones investments away from the strategic allocation targets in an effort to invest in the asset style that appears to be undervalued or the one an investor believes will provide a higher return in the short run. To some, tactical asset allocation is referred to as market timing. An investor must ask themselves what is the appropriate asset allocation. There isn’t one correct answer. For an investor whose investment assets are only sufficient to support their lifestyle, that investor should be concerned with losing principal in a down market. On the other hand, the investor needs to achieve a return at least equal to the rate of inflation so purchasing power is maintained. The best chance to achieve this result is to establish a core portfolio of high quality dividend growth stocks. 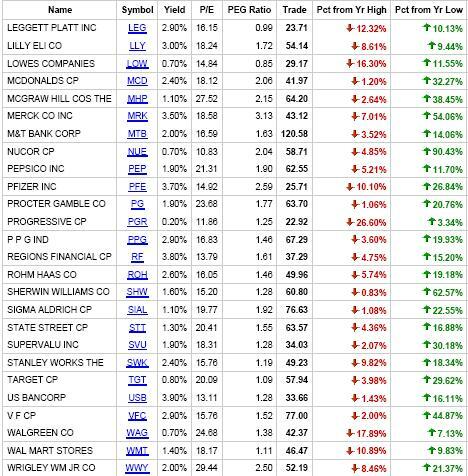 These higher quality dividend paying stocks, historically, have lost less value in down markets. 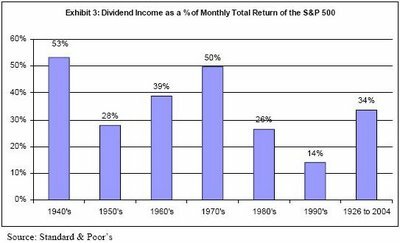 Conversely, in up markets, and over longer term time periods, the higher quality dividend paying equities have outperformed the S&P 500 Index. The investor can then build smaller investment positions around the core portfolio if the investor desires exposure to other equity asset classes. The goal of a financial advisor should be to focus on an investor’s financial needs and goals over short and long term time horizons. From these goals and objectives, the FP should construct a portfolio that will strive to achieve a rate of return sufficient to grow ones investments to a level that equals or exceeds target asset levels developed in a financial plan. The benchmark for ones returns does not need to be a specific index, but should be the goals and objectives of each investor. If the S&P is down 20% in a specific year and an investor’s portfolio is down 18%, does this result achieve the target asset levels developed in the financial plan-not likely. In conclusion, an investor should be aware of the fact the BHB study’s conclusion that 93.6% of an investor’s variation in returns is attributable to strategic asset allocation. 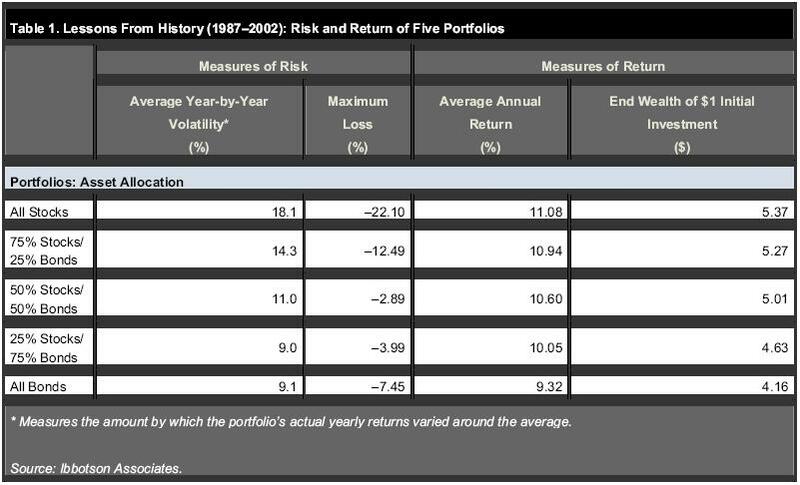 The BHB study’s focus was on variation, or range of returns between the highs and lows. The BHB study did not address the allocation that would achieve the higher overall rate of return. Several years ago an article titled Following the Bouncing Market was published at www.smartmoney.com. The article discussed what type of stocks outperform the market in December and why. Standard and Poor's notes "Stocks Stage Pre-Election Rally"
Stocks finished broadly higher Monday, boosted by some large buyout proposals. The docket for economic data was quiet this session ahead of Tuesday's congressional elections. Big money reportedly flowing in from Europe may also have lifted sentiment, amid indications Republican candidates may be narrowing the gap against their Democratic rivals, says Standard&Poor's Equity Research. On Monday, the Dow Jones industrial average rose 119.51 points, or 1%, to 12,105.55. The broader Standard&Poor's 500 index added 15.48 points, or 1.13%, to 1,379.78. The tech-heavy Nasdaq composite climbed 35.16 points, or 1.51%, to 2,365.95. 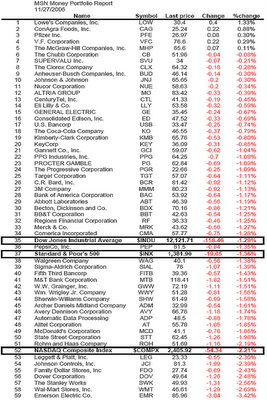 NYSE breadth was decidedly positive, with 25 issues advancing for every 8 declining. Nasdaq breadth was 21-9 positive. The upcoming election results could impact the markets in the short-term, though fundamentals will ultimately be more important, some analysts say. "If the Republicans do retain both houses, then the market is likely to have a short-term reaction rally," says Richard Bernstein, chief investment strategist at Merrill Lynch, in a research report. "If the Democrats win both houses, then the market is likely to have a short-term reaction sell off. A split probably has little impact." A Democratic takeover of one or both chambers of Congress could be good for Treasuries, others say. 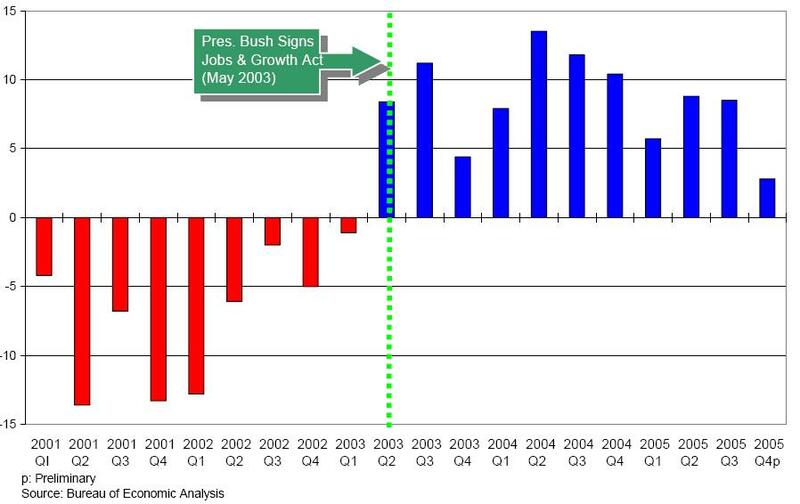 "As long as the economy continues growing at a reasonable clip, gridlocked government would provide an excellent backdrop for continued improvement in the budget deficit, with any significant new spending programs having little chance of getting past a White House veto and any attempt to extend or make permanent various temporary tax cuts a likely non-starter in a Democratic Congress," note Morgan Stanley economists Ted Wieseman and David Greenlaw. 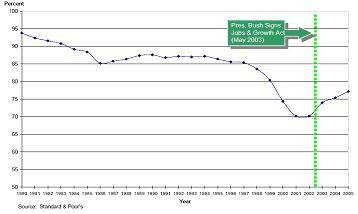 "Gridlock certainly worked wonders in the second half of the 1990s for the budget." Still, other analysts don't expect the elections to swing the markets much in either direction. "The elections are unlikely to move markets in a big way unless the Republicans manage to maintain control of both Houses of Congress," says Steven Ricchiuto, chief U.S. economist at ABN Amro. "Gridlock will continue to dominate Capitol Hill politics under almost all possible election scenarios, but foreign investor confidence will be shaken if the Republicans hold onto the House." Investors were digesting M&A news Monday. Four Seasons Hotels (FS) received an offer to take the company private for $3.7 billion, or $82 per share in cash. The November 8, 2006 edition of Standard & Poor's, The Outlook ($) newsletter contained an analysis of the impact on the equity markets based on which party or parties controlled Congress. 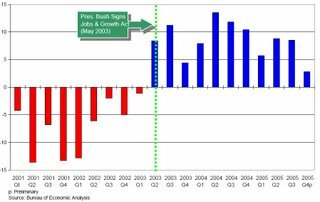 Sam Stovall, S&P Chief Investment Strategist, notes, "...Next year marks the third year of President Bush’s second term in office. 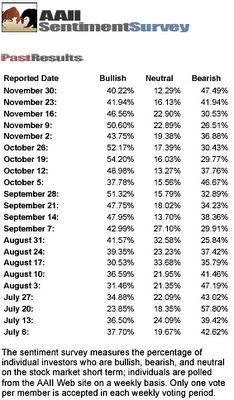 Historically, stock prices have posted their best performances in the third year of the presidential cycle, rising an average of 18% since 1945 vs. an average of 9% for all four years. What’s more, third-year advances have been very consistent, as the S&P 500 climbed 93% of the time (the market was flat in 1947). The last time the “500” declined in the third year was 1939. 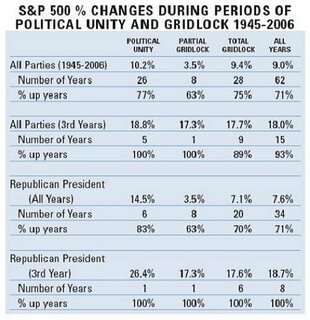 The fourth year’s 8.6% average increase is second highest..."
"...The S&P 500 posted better returns (and frequency of advance) during periods of political unity, but surprisingly strong results under the total gridlock scenario. 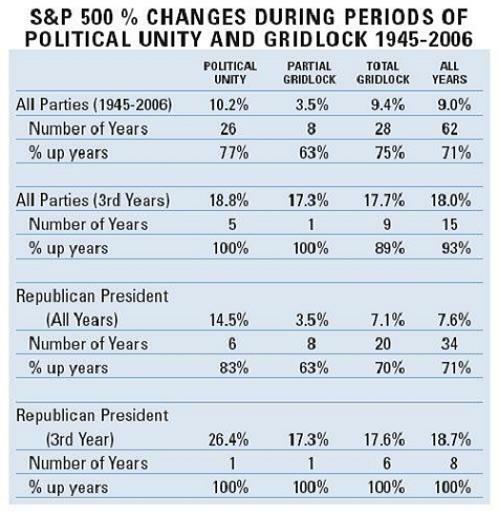 The periods of partial gridlock, which were relatively rare, saw the weakest market returns on average..."
The analysis concludes, "...Since the stock market has performed well during periods of both political unity and total gridlock, the conclusion we draw is that either Wall Street doesn’t care who is running the government, instead focusing more on the Fed and fundamentals, or it dislikes disunity and would prefer to see a unified Congress — regardless of the party." 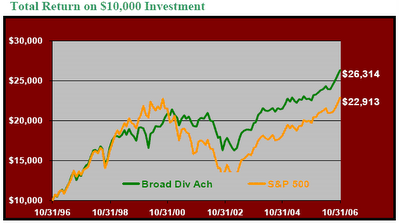 Article on Dividend Investing: The Search For Returns by Joseph McKittrick in SFO Magazine. 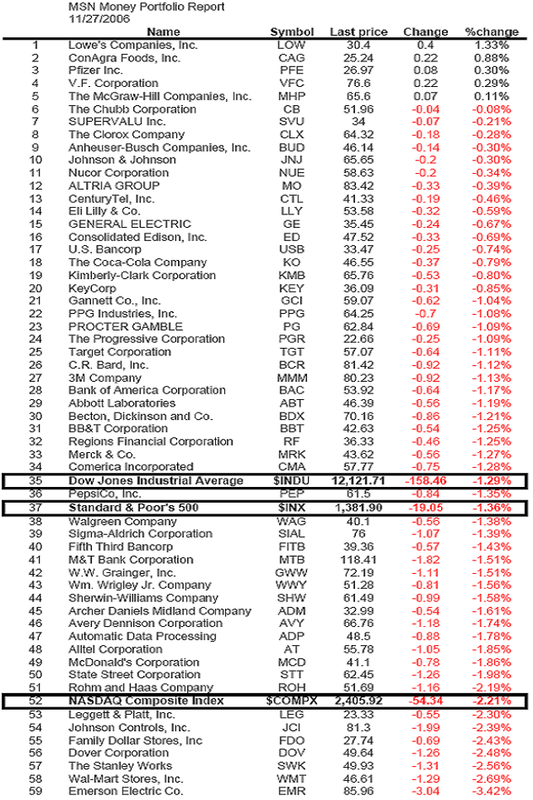 Standard and Poors Quality Rankings Portfolio Performance, Risk, and Fundamental Analysis. 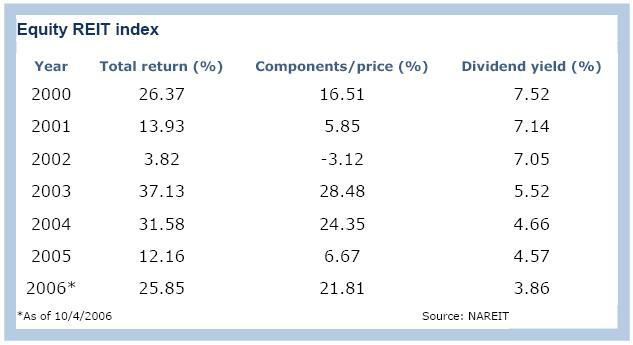 note performance of higher quality rated stocks in down markets. 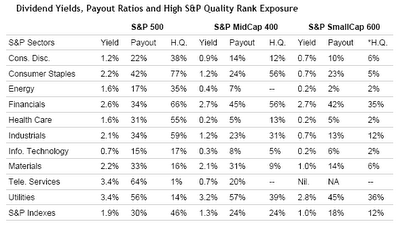 Overall risk adjusted return better for higher rated stocks. 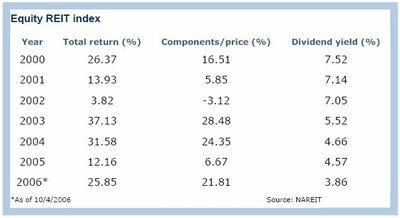 higher rated stocks have better fundamental characteristics as detailed in Table 5 of report. After the market closed on Tuesday, the Canadian Finance minister announced the government had plans to tax income trusts in line with corporations. The tax would go into effect in 2007 for new trusts. Existing trusts would have a four year grace period before the tax would hit those companies. 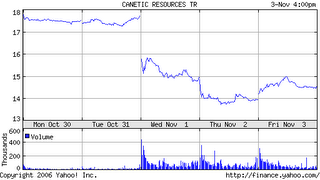 The announcement resulted in significant declines in the price of the shares of Canadian Income Trusts. 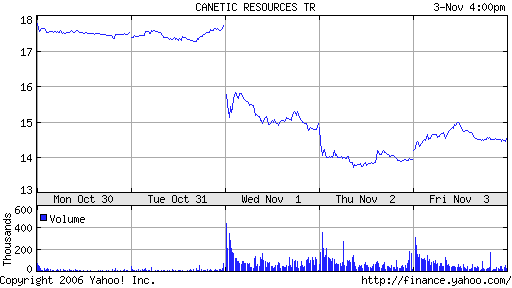 The reason for the share price decline is directly related to the fact the Canadian trust will have less “cash flow” to pay out as a dividend, repurchase stock or reinvest in the business because of the increase in tax on the company's earnings. The next significant event that could impact these shares is dividend cuts. I would caution an investor that desires to purchase shares in these trusts based solely on the trust's current yields. If Congress in the U.S. were to eliminate or let expire the 15% tax on qualified dividends, it would be highly unlikely that U.S. dividend paying stocks experience a similar price decline like that of the Canadian Income trusts. 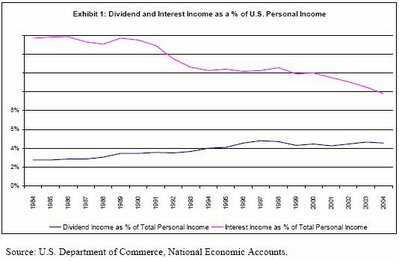 The reason being cash flow for the U.S companies would not be impacted by a higher tax on individuals that receive the dividends. Certainly, the U.S company may reduce the dividend growth rate; however, the U.S company would still have access to the cash flow and the company may use the cash to either repurchase shares or reinvest in the business. Should an Investor Worry about the 2010 Expiration of the Reduced Tax Rate on Dividends? 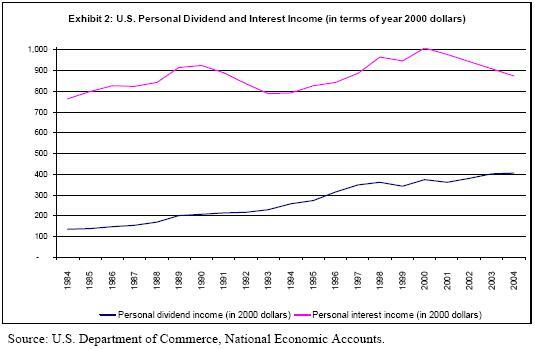 Congress has extended the 15% tax rate on qualified dividends to 2010. 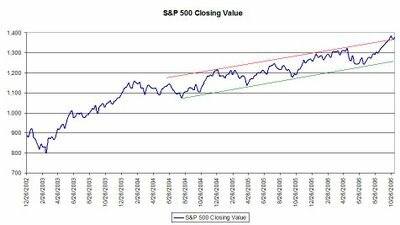 Would its expiration impact the market performance of dividend paying stocks? First one needs to look at the impact on equity performance with the initial passage of the 15% tax rate on dividends contained in the Jobs and Growth Tax Relief Act of 2003. The Federal Reserve publish a paper in 2005 reviewing the impact on equity prices leading up to and following passage of the tax reduction act. In short, some state equity prices do not seem to have been greatly impacted by the reduced tax on dividends. 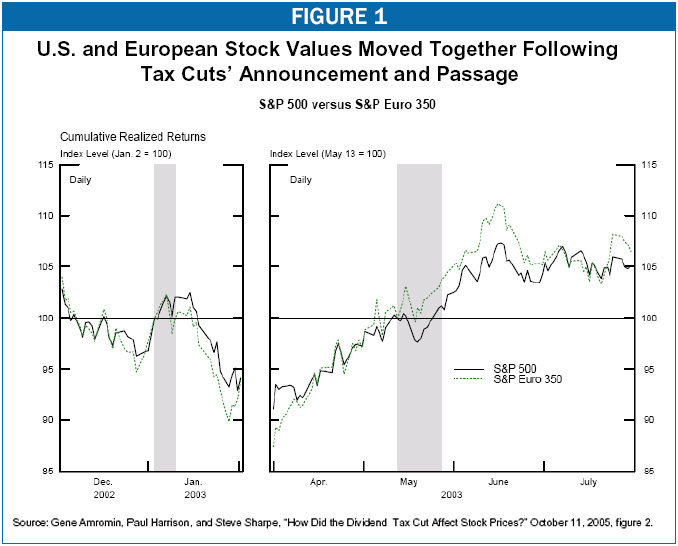 This would seem a surprise since investors should be attracted to stocks paying a larger after tax dividend. 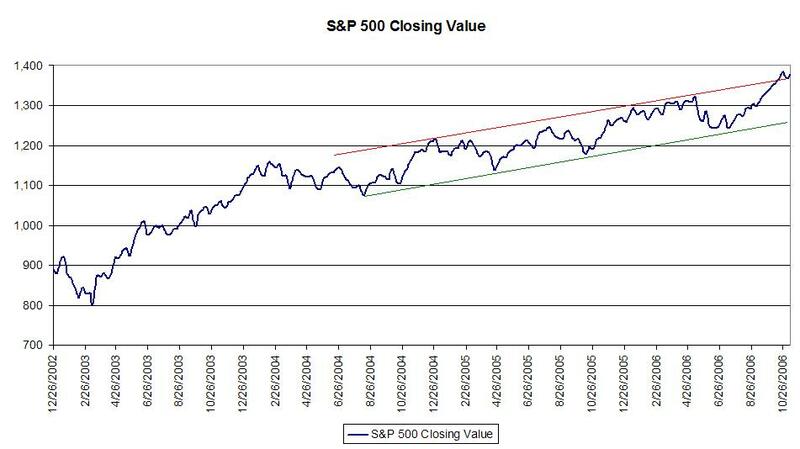 It is rare that one can point to a single factor when determining the movement of stock prices. The Federal Reserve paper notes President Bush’s Iraq ultimatum occurred on March 17, 2003. This was just two months after the President’s announcement of his tax cut proposal. The President signed the bill on May 28, 2003 and many articles discussed the favorable impact this bill would have on dividend paying stocks. A stock market rally did ensue in January 2004, but was short lived when Alcoa reported disappointing 4th quarter results. The data is mixed on what has contributed to the strong market performance since the tax cut. What is certain is economic growth did improve subsequent to the passage of the tax reduction act. Additionally, more companies began paying a dividend subsequent to the passage of the reduced tax rate on dividends. So the question of whether a change in the tax paid on dividend distributions is an important one; however, the fundamental cash flow of companies has a larger impact on stock prices. With a change in the tax rate on dividends, the operating cash flow of a particular company remains unchanged, unless economic growth slows. The benefit of using a dividend growth discipline in selecting equity investments by an investor is this procedure enables the investor to gauge the operating stability of a company. Focusing ones investment analysis on companies that have ten or more years of consistent dividend growth likely mitigates the potential impact of dividend tax changes. Following is an update on the performance of dividend paying versus non-dividend paying stocks in the S&P 500 Index for the month of October. This information is compiled by Standard and Poors.